It is our mission and our purpose to help our clients rebuild their lives. And I’m proud that we have a firm that can accomplish that every day for the people who choose us to represent them. 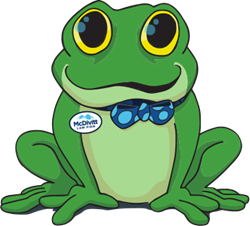 In an effort to stand out from a crowded field of Colorado-based personal injury attorneys, McDivitt Law Firm has launched a frog at the end of its ads to say, “McDivitt” (instead of “ribbit”). The firm’s owners hope this will help Coloradans hurt in an auto accident remember who to call when they have questions about their injuries and their rights. Colorado airwaves are filled with ads for PI attorneys. McDivitt prides itself on standing out by using personalized customer service for its clients, while providing a vast amount of experience and knowledge to help clients get the compensation and attention they deserve following an accident. McDivitt Law Firm is a family owned firm that has been operating in Colorado for more than 25 years. Its attorneys and legal specialists are dedicated to ensuring its clients are well-informed, and fiercely represented. The firm works on a contingency fee basis, which means there are no out-of-pocket costs to hire the firm, and no money is owed until McDivitt settles the case. The firm’s new tagline, “Tricky to say. Easy to call.”, rolled out along with the animation of the frog. The effort is intended to poke fun at the unusual firm name, while emphasizing that reaching out to the firm is easy and immediately takes a load off people who have been through a traumatic experience. McDivitt Law Firm has five offices throughout Colorado: two in Colorado Springs, one in Aurora, one in Denver, and one in Pueblo. The team is made up of nearly 80 attorneys and team members. The family-owned firm has been operating since 1992, when it was established by Mike McDivitt and his wife Karen. McDivitt Law Firm also maintains several community outreach efforts through McDivitt Makes a Difference.